and kick-start your intuition even if you don't know all the card meanings! 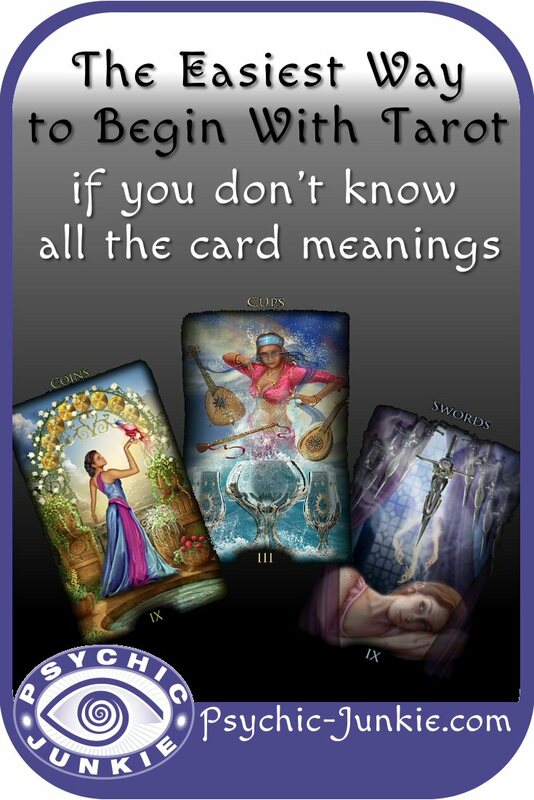 Another way to develop psychic abilities is to begin with tarot. You can kick-start your intuition when you don't know all the card meanings. Let's face it - Tarot can be an overwhelming discipline. Seeing the destiny in the cards may seem like an attractive prospect but the reality is altogether different. The images teeming with people and various kinds of animals, the hermetic symbolism, the astrological correspondences, the kabbalah and the elemental affinities of the suits are enough to drive any beginner mad - and away. Getting even a basic grasp of all this seems to require so much hard work, it is almost not worth it. But is it really so? Is studying Tarot supposed to be such an ordeal? Or should you just put your deck on the shelf, forget all about it, and pick up runes or tea leaves instead? Not quite! While all the above-mentioned facets of interpretation may come in handy at later stages of learning, the beginner needn't worry about them. There is a way around it all. Just look at the pictures! It's as simple as that. Nothing more, nothing less. Just look at them and say what you see. The pictures were put there for a reason. Instead of bare numbered pips of regular playing cards, we have the luxury of vibrant visual imagery that was devised to tell a story. So when you begin with Tarot allow it to do so. Shuffle your deck, pull out three cards, lay them down and observe the images before you. For example, let's say you have pulled the following: Nine of Pentacles, Three of Cups, and Nine of Swords. What do you see? Say whatever comes to your mind first. Say it out loud. Even if it sounds silly, childish, too mundane or too out there - don't be afraid. By looking at the cards, you may say that a rich woman (9 of Pentacles) is going to a party (3 of Cups) but will have a terrible hangover and headache the next day (9 of Swords). Not quite high magic nor deep spiritual insight into five of your past lives - but it serves its purpose. Sometimes, Tarot just wants to warn us not to make silly mistakes. 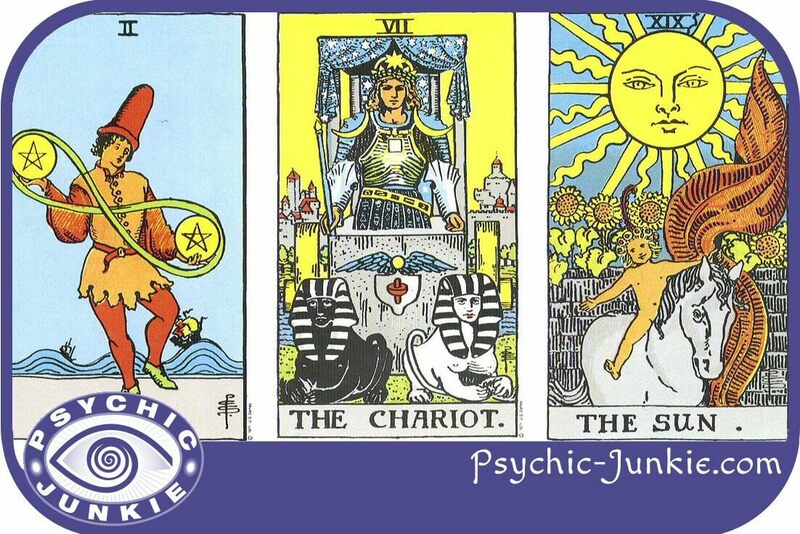 Giving it another go, you pull Two of Pentacles, the Chariot, and the Sun. You see a male figure balancing some coins, an odd vehicle pulled by two mythical creatures, and a child on a horse enjoying the blazing hot sunshine. The first thing that may come to your mind is that good financial maneuvering will finally enable you to afford the summer holiday you've been wanting to splurge on for a while. Of course, hundreds of other interpretations are possible depending on the context, the card positions etc. but you shouldn't burden yourself with that just yet. When you begin with Tarot, it is important to stay open-minded, be playful and spontaneous. This way you can access your intuition with ease. Don't forget to practice, do fun readings for your friends and family, and keep the fear at bay. Over time, you will be able to expand your knowledge and go further but, for a start, a fresh approach and some enthusiasm can still get you far. Try some Online Tarot Readers with free time to find the best connection.